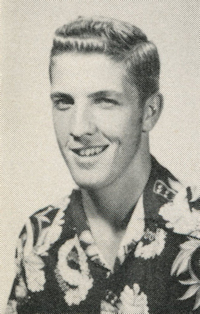 Obituary – Studebaker, Ralph Dean « Perry High School Alumni Association, Inc.
﻿All-State- Football 51, Football 48-52, Football Co-Captain 51-52, Basketball 48-52, Baseball 49-51, Teen Town Council 51-52, Student Council 47-48; 50-51, Mayor of Teen Town 51-52, Class President 50-51, Junior Play 50-51, Annual Play 51-52, Boys State 51, Perryscope Staff 51-52, F.T.A. 51-52, All-District Football 51. ﻿ Ralph Dean Studebaker, 76, of Pleasanton, California died unexpectedly in his sleep at his home on July 18, 2011. Ralph was born August 18, 1934, in Perry, Oklahoma to Ralph Ernest and Goldie Studebaker. He graduated from Perry High School in Oklahoma in 1952 and honorably served in the Marines from 1953 to 1956. Ralph went on to complete his education at Washington State University, graduating with a bachelor’s degree in Restaurant/Hotel Management. Ralph was a highly creative culinary artist who loved his work and took great pride in producing innovative fare at the restaurants he owned over the years. For the past 22 years he owned and operated the Railroad Café in Livermore, California with his wife Jo. Although never receiving official acclaim, he could arguably be credited for introducing California Cuisine decades before it became popular. While attending high school. Ralph earned All-State honors in both football and track and field. Ralph served on the Diablo Valley College Culinary Board of Directors for several years. When not creating a delicious new menu. Ralph loved to garden with his cocker spaniel, Sadie, follow Sooner football, and the Oakland A’s. Ralph will be deeply missed by all who knew him. He is survived by a loving family: his wife Jo of 42 years, Pleasanton; sister Pat and husband Ward, brother Donald and wife Ginny; three children: Stacy and husband Glenn, Kendon and wife Robin, and Dean. Ralph’s recent joy has been spending the last few years with his two beautiful grandchildren, Kaydon and Wyatt. Ralph was preceded in death by sister Peggy and brother Ken. He is survived also by an uncle and aunt, Harold and Vinita Hodge, and aunt, Maxine Studebaker, all of Perry. In lieu of flowers please send donations to: VA Palo Alto Health Care System Volunteer Services, Attention: William Ball PAD 135, 3801 Miranda Ave., Palo Alto, CA 94304.